Can Giant Sequoias Survive the Future? Hear my companion radio feature on The California Report weekly magazine. Giant sequoias naturally grow only on the western slope of the Sierra Nevada. When William Tweed talks about giant sequoias, he doesn’t beat around the bush. 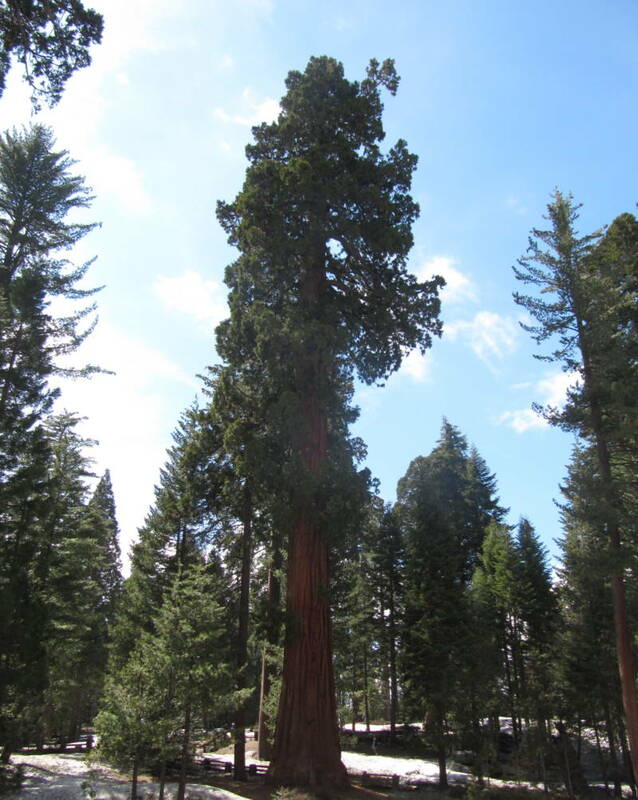 He says while other parks have charismatic megafauna, like bears, or bison, or elk, Sequoia-Kings Canyon National Park and the other national parks in the Sierra Nevada have charismatic megaflora: the giant sequoia. The Sierra parks — Yosemite and the merged Sequoia-Kings Canyon — have some of the nation’s oldest; all three were created in 1890 (the Park Service itself didn’t exist until 1916). The Service’s long history with the giant sequoia is clear even down to the ranger uniform. There are sequoia cones on rangers’ belts and hats, and a giant sequoia on their badges. But the giant sequoias may not last in the parks where they live now. Climate change threatens to make summers in the Sierra warmer and drier. Under those conditions, sequoia seedlings won’t take root. When a giant sequoia dies — and the recent toppling of two of them reminds us that they eventually do — there may not be a young one ready to spring up and take its place. “This was set aside under the premise that it’s pristine. That it could remain intact,” says Tweed. “Well, it may not be possible.” He says it’s unsettling. He came to Sequoia National Park decades ago, with the promise that the park would always be protected, and would never change. But it turns out that ideal of the parks being preserved in perpetuity was never really possible. There are too many complications. Providing access to the public to enjoy the parks, while also preserving the natural and historical resources is enough of a challenge. Add to that questions about where and when to allow fire, how to handle weeds and non-native animals, and how to protect or reintroduce endangered species. The goal of keeping things natural, or even agreeing on a definition of “natural” is complicated enough, without having to factor in climate change. So the parks are learning to adapt, and they’ll probably take different approaches in different places, as they already have with fire, weeds, wolves, and construction. Maybe Sequoia National Park will water some of its sequoia groves in the future. Maybe parks further north that end up with a Sierra Nevada-like climate will plant sequoias. Maybe in some places, the park will just let nature, whatever that is, take its course.